There are lots of people out there writing and thinking about that question. One important thing shows up on the lists from think-tanks and civic engineers: Neighborhoods are great when they are shaped by, and an inspiration to, the people who live there. Bottom-up rather than top-down strategies tend to work best. That is because the people who live in a neighborhood are the world's experts on that particular place. Any project to improve things should be guided at least in part by community wisdom. And that is why Tenney-Lapham neighborhood will not be ordering a professionally produced 'wayfinding' sign from a company like called something like "Signature Street Signs." Our new neighborhood sign will be designed by us! Anne Katz is helping to organize the effort. 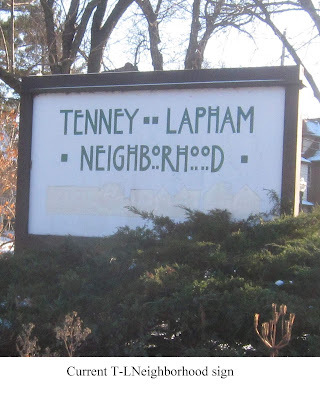 She is an arts advocate professionally and a neighbor whose energy and inspiration over the years has contributed to making Tenney-Lapham neighborhood a wonderful place. I asked her to tell me why she believes this sign matters. Anne: I grew up in the New York City suburbs and although our family was friendly with many of our neighbors, we didn't know most of them very well. I've lived in the Tenney-Lapham neighborhood since I moved to Madison in 1984. In those 34 years, I've lived in three different houses within a ten-house radius on North Few and Jean Streets. We know many of our neighbors very well. Our son had a community watching over him as he grew up and we get to watch over our neighbors' kids now. We are so happy to help keep the neighborhood vibrant and welcoming. A welcome sign does just that...it welcomes friends, family, visitors, and neighbors to the community. It helps strengthen the sense of place that makes this a special place to live. The design contest gives people a chance to share their ideas about the community in a creative way. The sign lets people know where they are and opens the door to our special place. You can submit up to three designs for consideration. Send a jpeg of the design, as well a description of yourself and the materials you envision using, to annedave@chorus.net. The winning design will be unveiled on September 9th and the winner will receive $100. Learn more about what your friendly neighborhood judges are hoping to see in the full Call For Proposals.